Eleven sophomores will travel 1 1/8 miles at Gulfstream Park in Saturday’s $1 million Florida Derby (G1) . The Road to the Kentucky Derby series event offers 100 points to the victor, with the top pair more than likely to qualify for the Run for the Roses on May 4 at Churchill Downs. FREE Triple Crown PPs courtesy of Brisnet.com! The morning-line choice set wicked fractions before tiring late in the Fountain of Youth Stakes (G2) most recently. The Kentucky-bred draws well inside and will be the one to catch and beat with a clean break in this spot. Javier Castellano inherits the mount. This proven turf performer was third in his seasonal debut, the Dania Beach Stakes, and will attempt to transfer his ability to the main surface here. The $725,000 yearling purchase comes in with a bullet drill in advance of this test. The colt could be a late exotics contender with a step forward. The Kentucky-bred has been first or second in each of his five assignments to date. The Holy Bull Stakes (G2) hero smoked a half-mile bullet most recently on this oval and will be rallying from well off the early tempo. This well-bred son of Tapit put in a fine rally to be runner-up in the Fountain of Youth (G2) last out. The talented three-year-old should relish the added distance in this spot and rates as a major player once again. 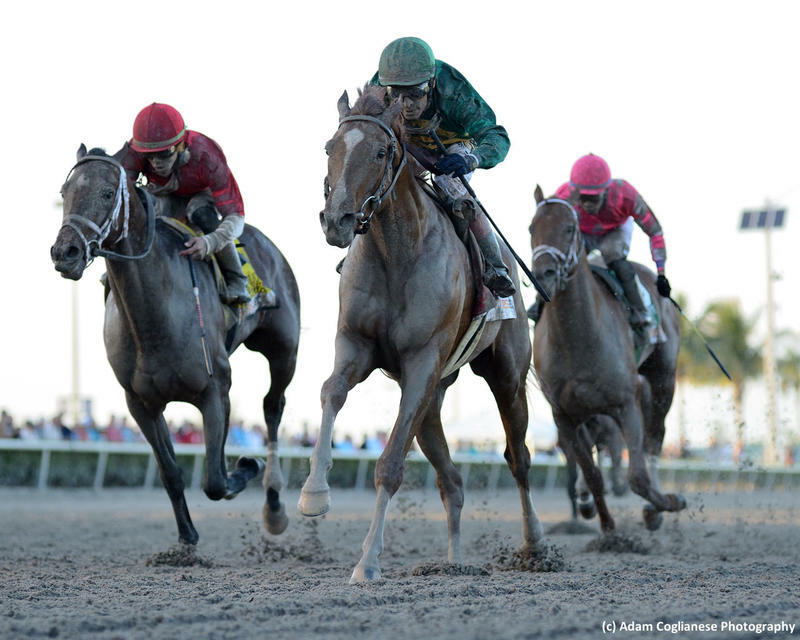 The Holy Bull Stakes (G2) runner-up never fired in the Fountain of Youth and will look to rebound in this major test. The inconsistent Kentucky-bred will need a lifetime best to challenge the top runners in this field. The dark bay colt has not hit the board in five straight races and would be an impossible winner of this event. He could be an early pace presence but has little chance to be in the race turning for home. A wildcard in the cast, he has been untested following a trio of dominant triumphs against lesser at this venue. The former maiden claimer could be any kind in his first serious class test. The homebred will be forwardly placed from the start. This longshot comes off his best run to date when a neck second in a maiden special weight race here. The Kentucky-bred has ability, though he picks an awfully ambitious spot to garner his first career victory. The Fountain of Youth (G2) winner has a strong turn of foot and could surely move forward in his third assignment of 2019. The Kentucky-bred colt shows two bullet drills following his biggest win to date, and he will be a force with any kind of forward move on Saturday. This sneaky exotics contender had little chance in the Fountain of Youth (G2) after going seven wide in the early going. This colt ran a big one two back in the Smooth Air Stakes and he should be of great value in his second run this season. Owner: Jacks or Better Farm Inc. This Florida-bred ran evenly in the Holy Bull (G2) most recently and will run with blinkers off for the initial time in here. The multiple stakes hero draws widest in the field. However, he owns the top BRIS Speed numbers among the cast (103 and 102) and can’t be ignored at a nice price.